The Rime Center has a nursery available for parents with infants. We ask parents to please bring their infant’s diaper bag to leave during the service. 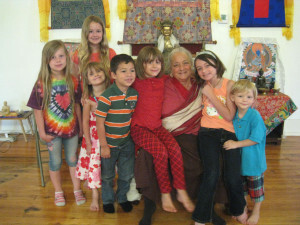 Our Rime Dharma School meets upstairs every Sunday for ages 4-12. The Dharma school is dedicated to the cultivation of wisdom and compassion. The Dharma school is a refuge for the nurturing of inner peace, kindness, and community understanding. The Dharma school’s primary objective is to provide a qualified program of Buddhist studies for children. Parents are reminded to sign their children in and out of Dharma School. Find out more with our Facebook Community.